We recently published the images and short biographies of 99 Irish women who applied for U.S. passports, based on either their marriage to a U.S. serviceman or their own services in support of the American military-effort during the First World War (see here). The data we collected offers us many potential insights, and we intend to use it to explore a number of different themes. In this post we have taken some of the data specifically relating to local women who married U.S. Naval personnel, and used it to visually map where they were from, and where they intended to make their new lives. 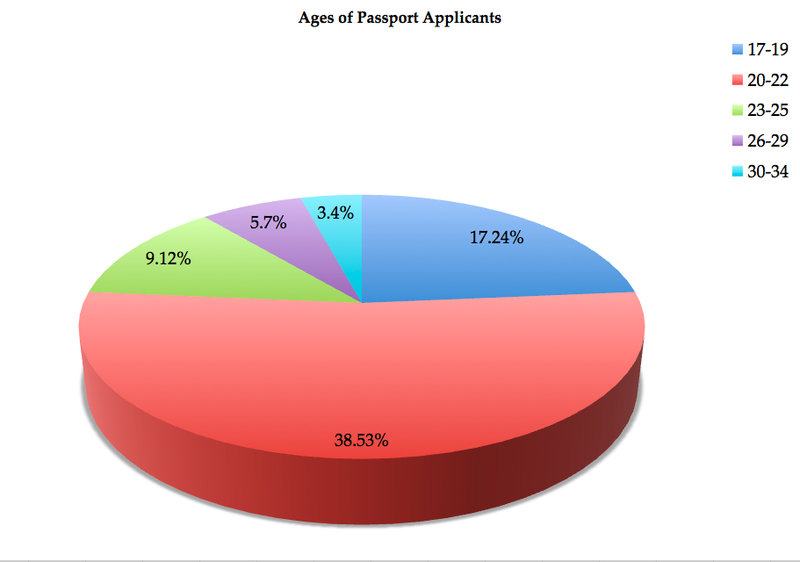 We identified 73 Irish women in the Passport applications who married U.S. Naval personnel serving in Ireland and Great Britain during the First World War. It should be noted that the vast bulk of these women had never been outside of Ireland prior to their marriage, and their intention to travel to the United States represented the first prospect of foreign travel for most of them. Up to 8,000 U.S. sailors served in or around Ireland at one time or another during the Great War, and it is no surprise that many struck up local romances. These liaisons with local women were often not welcomed by the local population, and occasionally led to violent clashes, particularly in Cork and Queenstown (Cobh) where the majority of bluejackets were based. The research of Dr. John Borgonovo of U.C.C. has shed considerable light on the often intense level of ill-feeling this created, and it will be something we explore further in a later post. Before looking specifically at the visualisations, it is worth remembering that in almost every case the women who married these sailors were very young. The graph below demonstrates this. Of the 73 women, only three were over the age of 30. The vast majority (64, or 90.9%) were aged between 17 and 25. 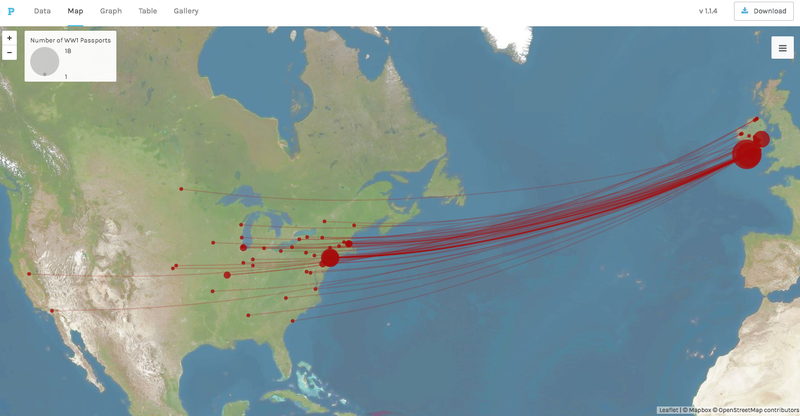 In order to visualise the data we have turned to Palladio, a web-based platform developed by the Humanities & Design Research Lab at the Center for Spatial and Textual Analysis, Stanford University. Palladio was developed for the visualisation of complex, multi-dimensional data. It is free to use– all that is required is having the information in tabular format to upload and the time to prepare it appropriately. For that purpose we decided to spatially explore two elements of the data– where the Irish women who married these U.S. Naval personnel were born, and where they intended to travel to in the United States. 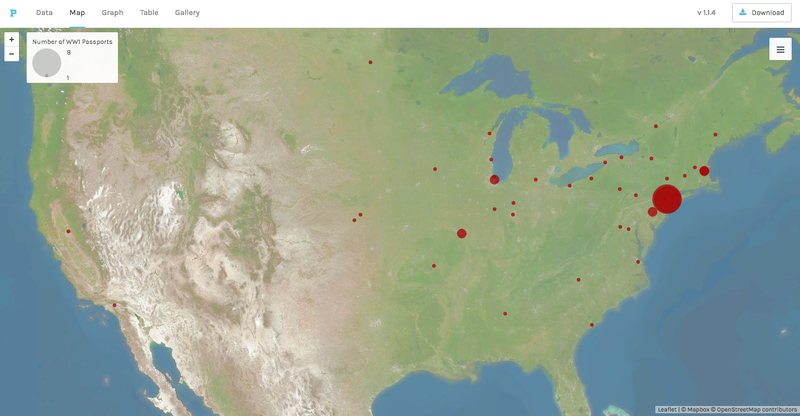 The first map above presents each of the locations where Irish women who married U.S. Naval personnel were born. One of the most significant aspects of this is that women from every location where the Americans were based during the war are represented, including Queenstown (Cobh), Aghada, Passage West, Haulbowline, Bantry Bay, Wexford, Donegal and Dublin. The next map indicates the relative concentrations of women in these birthplaces, with 1 being the lowest and 18 the highest. Unsurprisingly Dublin offers one of the main concentrations, but by far and away the most heavily represented area is Co. Cork, a result of the fact that the bulk of U.S. servicemen were based there during the war, particularly around Cork Harbour. Of the 73 women identified, 50 were from Co. Cork. That concentration warrants a closer look. A focus on Co. Cork shows that Cork City dominates with 18, followed by Queenstown (Cobh) with 13 and then Youghal with 4. 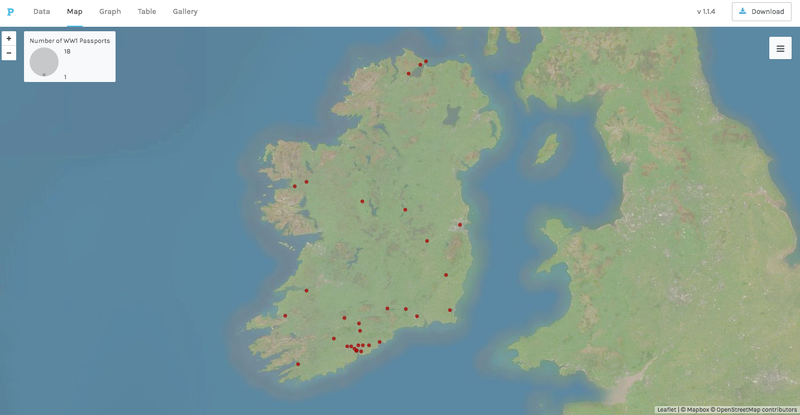 The majority of the other Cork women came from the east of the county, with outliers in locations such as Bantry, likely associated with the U.S. Naval presence in Bantry Bay and on Whiddy Island. Each of these Irish women took had decided not only to the marry an American, but also to leave all they had known behind for the United States. Though there is some evidence to suggest that not all of them would ultimately travel across the Atlantic, the majority of them undoubtedly did. We turn now to the other side of the Atlantic, to see where they hoped to end up. 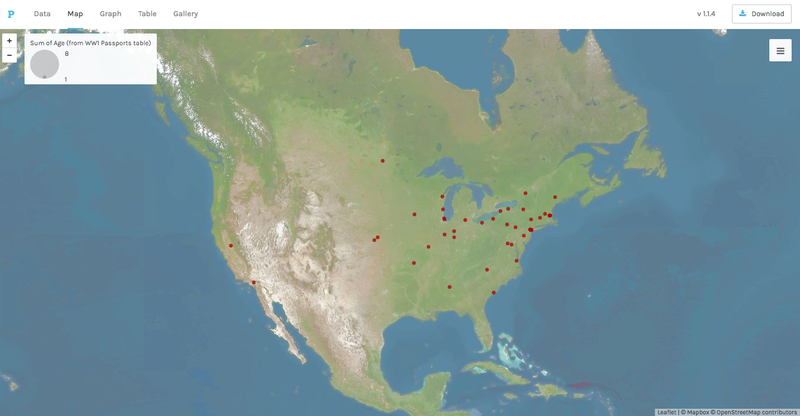 As is evident in the visualisation above, these Irish women were spread across the length and breadth of the United States, particularly in the east and mid-west. The map below illustrates their relative concentrations. There is a notable concentration on the east coast, particularly in New York and in states such as Massachusetts and Pennsylvania, while some went initially to centres of the U.S. Navy where their husbands were based. The final sets of visualisations are perhaps the most poignant. 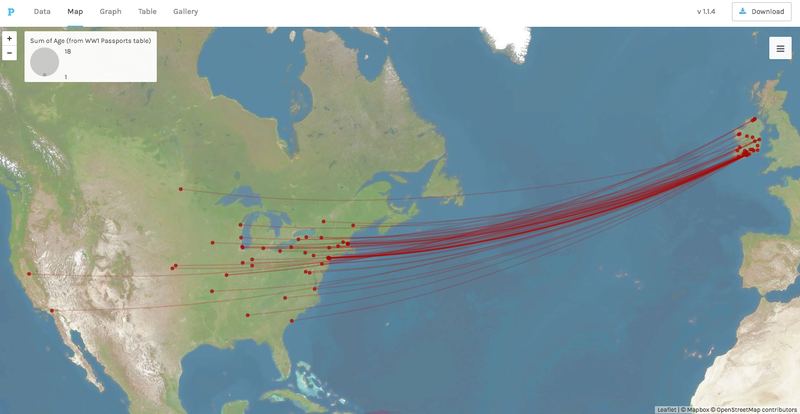 In them the data of the Irish women’s birthplaces and intended destinations are linked, showing how far from home they were travelling. They were journeying into the unknown, to meet up with husbands with whom they had at best spent only a few months, and often to locations where it is doubtful they knew a soul. There is also little doubt that for some, their decision to marry an American serviceman had met with the disapproval of, and potential estrangement from, their family in Ireland, another aspect we will return to in a later post. We will continue to analyse the data we retrieved relating to these Irish women in future posts. To view the data upon which these visualisations were based, you can view the original post here. Fantastic work! Math thú. May I ask you about the possibility of printing photos from these blogs for a school project which we are doing for the port of Cork 100th anniversary of us navy’s arrival. My email is included below. Many thanks! Hi Brid, please do that is no problem at all! Kind Regards, Damian.